We are absolutely stoked to have the earliest opening day in Cypress Mountain history and the first ski area in British Columbia to be open for the 2011/12 Snow Season! Over the last week the amazing Snowmaking Crew has turned 4.75 million gallons of water into 30 cm, or about one foot of snow, covering an area equivalent to 24 football fields on the north face of Black Mountain! The Great Grooming Crew has jumped in to spread the Man Made Snow deep over Upper Maelle Ricker’s Run (Upper Fork) and then fashioned a pretty nice “ski-out” through mid Jasey Jay (PGS) and on down to the bottom of Eagle Express. Full Day Adult Lift tickets will be $23.60, Youth $18.00, Senior $15.60 and Child $10.00 for tomorrow (afternoon rates start at 1:00 PM and are also 60% Off). There is more snow currently in the forecast for later this week and the Snowmaking and Grooming Crews are hard at work trying to open Panorama and Windjammer as soon as conditions allow. 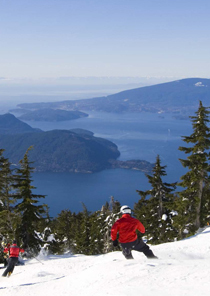 So plan to grab your skis or board the 2011/12 season is about to begin on Cypress Mountain!